With the Patriots off to a 7-0 start, the media strategy this year seems to involve talking up that week’s opponent (at least one that looks more than half-decent on paper), point out their strengths, and speculate on how they can beat New England. The more exuberant the prediction, the funnier it gets. Much like Daffy Duck as Robin Hood, the prognosticators keep calling, “Yoiks, and away!” and ending up with a tree trunk in the face. The Patriots open their season against Pittsburgh, a perennial contender featuring that gritty defense and Big Ben! Yup. Pats give up a late touchdown, but hold on for a 28-21 win. Patriots win 40-32 in a game they lead 37-13 after three quarters. All right, fine. Give it to me. Romo’s hurt. Weeden starts vs. the Pats, and that helps New England to a 30-6 win. Yes, but, here come the Colts! Looking for vengeance for their AFC Championship setback, Indianapolis, led by Andrew Luck, will do whatever it takes to deal the Patriots their first defeat. Colts lose, 34-27, but they do try whatever it takes, including one of the most poorly conceived fake punts ever. Oh, wow. Look at that. Why did they snap the – you know what? Let’s move on. We’re in a New York state of mind, as the J-E-T-S will challenge the Pats for dominance in the AFC East! They will challenge. And they will lose, 30-23. Brady will throw for two fourth-quarter touchdowns and lead the team in rushing. Well, he – sorry, say that last part again? New England hands off the ball five times all game. Brady, despite double-digit drops by his receivers, completes 34 of 54 passes for 355 yards. That is impressive. But, hold on, the Dolphins, though! Most-heralded defensive line in football! Undefeated under interim coach Dan Campbell! Two straight blowout wins! All true. Pats 36, Dolphins 7. Oof. Did not see that coming. Ah, but this week: the Redskins! Kirk Cousins in on fire! Yeah. He sure is. I guess we’ll have to wait and see. Despite the doggedly incorrect predictions, it’s a constant of the NFL that any team could knock New England into the loss column. Just look at the schedule. After Cousins and his well-rested arm visit Foxboro, Eli Manning could have another savant moment and put his Giants over the top. Trips to Denver (Nov. 29), New York (Dec. 27), and Miami (Jan. 3) are never easy. Hell, maybe the Eagles can pull it off Dec. 6. You never know. We’ve heard some talk about fans wanting to avoid an undefeated regular season. After how the last one ended, that makes sense, but the thing is, this season isn’t like 2007. We’ve been there, and as Bruce Allen so eloquently put it in February 2008, that was The Most Miserable 18-1 Season in History. Part of that frustration stemmed from NFL fallout with the previous ‘gate, but most of it arose out of their loss in the 2006 AFC Championship and the desperate desire to get another chance. Now, to this year. New England won the Super Bowl (their fourth) in thrilling, exhaustive fashion. While last winter’s playoff foes have stumbled early this year, your Patriots have come storming back in late-season form. They will try to win every single week. To think that they lessen their chances of advancing in the playoffs due to regular-season success doesn’t give the players or staff much credit. Certainly not as much as they deserve. In Pete Carroll’s last year in Foxboro, New England went 8-8. In 2000, new coach Bill Belichick went 5-11. Since 2001, the Patriots have won. They have been to six Super Bowls. They have been to nine AFC Championships. They have had only one season with fewer than 10 wins (9-7 in 2002). Let’s appreciate what we have, here. Sit back and watch the show. The Jets could contend, but they’ve had a bad couple of weeks. New York built their defense on a stout, impressive line while bringing back a strong DB tandem. Their loss to the Raiders this week demonstrated that New England, to some extent, exposed them. If you can pass with consistency, you can move the ball. New York also seemed to lose their one QB who did not consistently crush their dreams when Ryan Fitzpatrick left the game with a thumb injury and got replaced by Geno “Jekyll/Hyde” Smith. On a positive note for them, the Jets got a coach who focuses on game-plan details rather than trash talk and bluster. Now at 4-3, they have games with the Jags, Bills, and Texans coming up, which could get them back on the winning track. Can they find stability? Next week’s divisional tilt up in Buffalo will tell us a lot. The Bills are indeed “building a bully.” Funny how new Bills coach (and former Jets coach) Rex Ryan said this on his preseason victory tour of Buffalo. Yes, a bully pushes people around. He picks on smaller, weaker targets. But doesn’t he always back down when confronted by a peer? Now at 3-4, interesting to see if the Bills can reevaluate themselves and focus on winning actual games rather than mid-week press conferences. They lost to the Jaguars in England (where they pronounce it JAG-ooh-AHS) but have had a bye week to prep for their biggest five days of the season: Dolphins Sunday, November 8, Jets Thursday, November 12. Anyway, the Patriots are on to Washington. We’ll give them a mid-season report next week. Sorry but I don’t really understand this article. Are these real quotes? if so can you please link them? I agree with your confusion. If these are bad media predictions coming the week before each Patriots game, whose specific predictions are they? Otherwise not only is it just creating straw men, it’s also doing so with perfect hindsight about the events supposedly predicted. I think it’s poking fun the common “wisdom” of each week’s opponent. Some of them were more common than others (Jets, Bills, yes; Jags, DC, not so much). Felgerizing is different because Felger and others believe (or pretend to believe) this ridiculous statements while Chris is merely mocking these statements. But, yes, some links would have strengthened the post. No, Ben, we don’t have to laugh at this. The Romo costume is at least accurate. 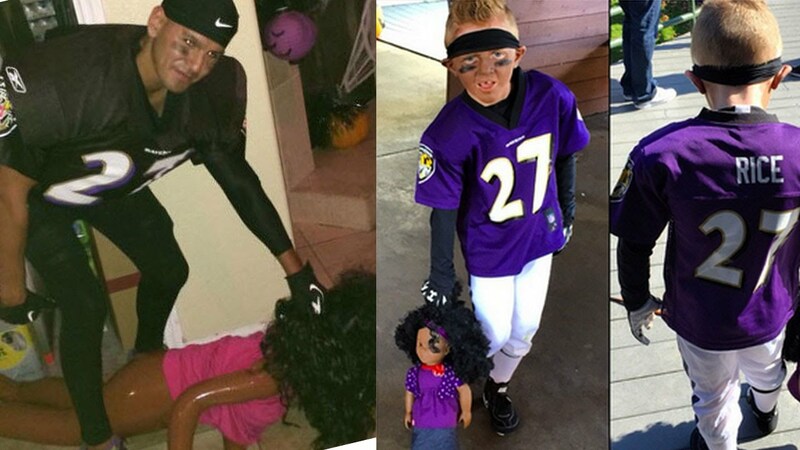 I generally don’t get worked up about offensive Halloween costumes, but, Jesus, that kid’s like 7 years old. What complete POS parents. Scary part is he’s only the third most detestable player for the Ravens of the last 15 years. 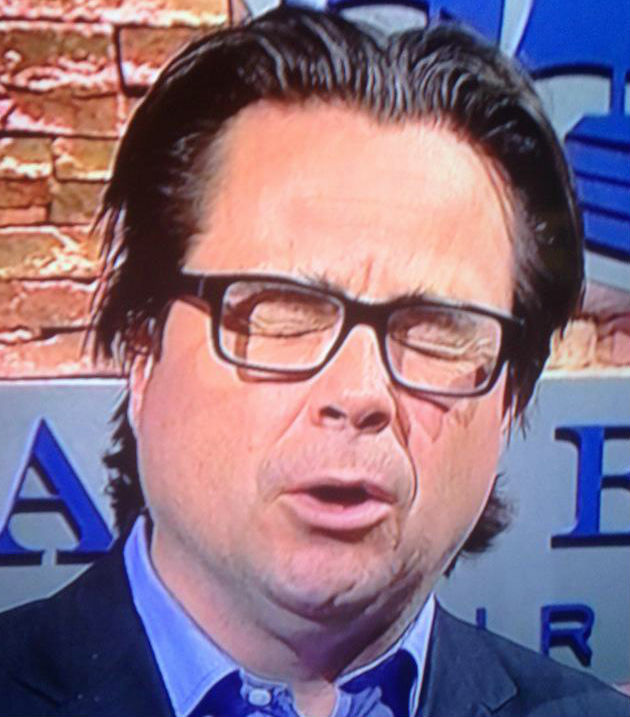 For the first time all season, I’m a little concerned about the Pats, because Tanguay, of all people, is the media guy who is most “out there” in telling everyone that Denver’s beat-down of Green Bay on Sunday doesn’t mean all that much, because the Patriots have better weaponzzzz than the Pack. I’d rather Gary just stick to his “sky is falling” schtick. When he’s optimistic, my natural inclination is to be pessimistic. Let’s establish one thing first: There will be no “gate” affixed to the growing mess the Indianapolis Colts find themselves in. Injurygate. Ribsgate. No gate. There will be no gate.That, however, doesn’t mean this isn’t serious, or that the Colts don’t have some explaining to do after Fox’s Jay Glazer, who I can never recall having been wrong, reported A) that Andrew Luck is playing with fractured ribs and B) the Colts never put Luck’s rib injury on the injury report, as is required by the National Football League. Willing to bet if we swapped the player and team name for, oh, say the Patriots? People would be vomiting all over themselves with trying to come up with the pithiest “-gate”. This might not rise to the level of a Deflategate or any one of the other “gates,” but, if true, it’s a serious offense. It’s especially serious if it involves Grigson, who blew the whistle on the Patriots’ use of deflated footballs in the AFC Championship Game. Why not? You guys love blowing that up. Oh, right.. it’s NOT the Patriots. Gotcha. In this league, and in this life, if you’re going to call out others for wrongdoing, you’d darned well better be sure to keep your own nose clean. If the Colts are popped for this, it will put Grigson in an even more tenuous position than he already is regarding his continued employment with the Colts. I could easily make the case that it’s a fire-able offense, especially if it results in a loss of draft choices. According to the policy, injury-list violations can result in team fines, fines or suspensions of the people directly involved and the possible loss of draft choices. How about a 1st + 4th and a seven-figure fine? This is from Kravitz? I love how he mentions “Deflategate” as if: A) Something actually was done to those footballs, when it’s pretty obvious by now that science, and only science, happened to them: and B) It’s somehow a serious issue deserving a “gate” attached to it. Well, it was his story initially, fed to him by a high-as-a-kite Irsay after the AFCCG, so I guess he has to go all Dan Rather with it and insist it’s true until the bitter, bitter end. Was on the treadmill last night infront of the sports channels, watching MNF Countdown. I couldn’t take my eyes away since they were spending the entire program talking about the developing scandal from the Bengals game on Sunday. 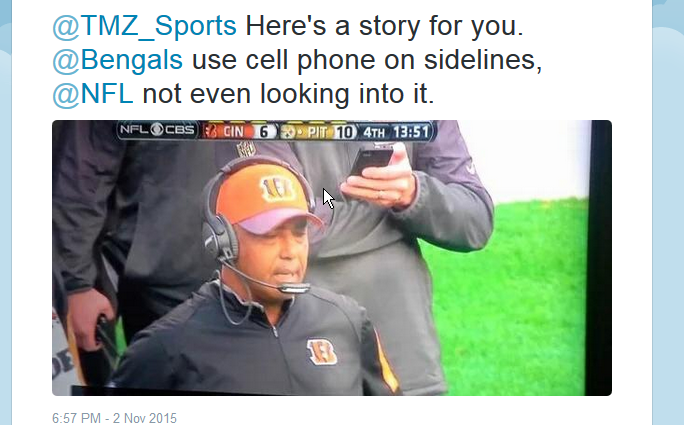 A staffer was clearly cheating and undermining the integrity of the game by using a cellphone on the sidelines. I was amazed at how something so innocuous could go to overblown, but, hey, we are obsessed with the NFL today, right? How is he outside the bench area? He’s behind and to the left of the head coach. It is more probable than not that your general awareness might be observing the screengrab correctly. Nothing infuriates me more than the local “TomatoCanz Take.” Half the league is comprised of terrible, poorly coached teams. These teams appear on everyone’s schedule. So why is it such a non-accomplishment when the Patriots go out week in and week out and take care of business? Further, which of the current teams currently in the playoff picture have played a “tough” schedule? My only point is that every team plays weaker opponents, but only the Patriots dispose of them with machine-like efficiency. This something you would think would be praise-worthy, not something worthy of derision. But then again, I’m not in the business of #HotSportzTakes. Tired of not being able to engage in #HOTSPORTZTAKEZ? Your #HOTSPORTZTAKEZ shouldn’t be either! Do you dream of a day your #HOTSPORTZTAKEZ are HOTTER than ever!? Hi, this is Jim Rome-y from Rome Is Burning En Fuego HOTTESTSPORTZTAKEZ Coaching Academy, where we coach up the HOTTEST of #HOTSPORTZTAKEZ in the business. Call us now, at 1-888-HOTTAKEZ, where we can sign you up for the best seminar and training on how to deliver the best #HOTSPORTZTAKEZ. We’ll help you deliver only the best and hottest takes, guaranteed to get you trending on da Twittah! Operators are standing by, 24/7/365. Handling and processing not included. Don’t wait! You’re missing out on the billions of dollars being able to deliver #HOTSPORTZTAKEZ are able to offer!. 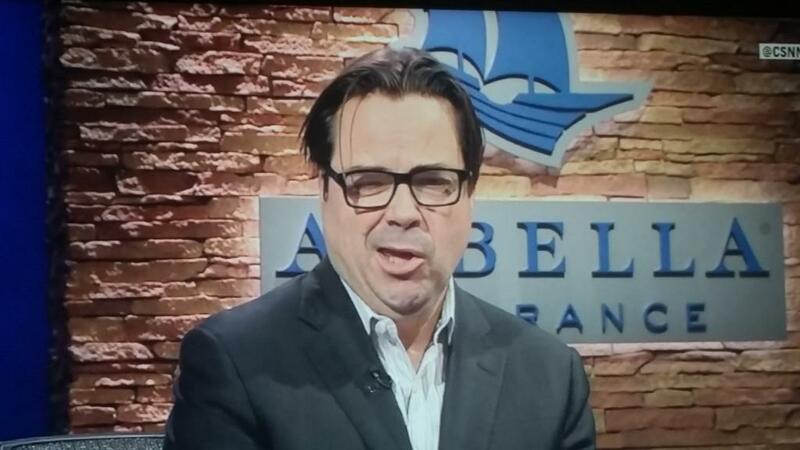 Don’t be lazy Christian Fauria and not call! Yeah, bruh. We’re cooler than the other side of da pillow! Seriously. And the compensation rumors ranged from a 2nd round pick in 2016 (unlikely since the league already stole their #1 pick and that would leave them not having any picks at all until the end of Day 2 — can’t see BB doing that); to a 4th and 6th, to whatever. Badly botched. I guess part of the problem was that fake Twitter accounts (using Schefter’s name, etc.) were used to “report” the news? Not sure. Still, these guys have to be more careful when it comes to reporting internet rumors as “fact” — always best to wait until someone directly involved with the talks confirms it. What was the deal they were saying was going to happen? Pats trading for Jason McCourty. Jimmy Stewart doesn’t know ANYTHING about sports. He is a bad actor, playing a role, on the entertainment show known as Felger and Mazz and on Twitter. yeah it’s retty bad when Dale Arnold is laughing and mocking you. 985 did not come acroos as the number one station that afternoon…amateur hour. But he has sources! Inside the Patriots! …granted, why he of all people would have any sources inside the Patriots is beyond me. First he is a nobody, and second, he bashes/trolls the Patriots on a percentage basis I would argue even more than Felger and Mazz. I think it’d be cooler that whenever Goodell is up there presenting the Lombardi, Brady/Bill punches them in the face really hard. Better: Belichick turns to Goodell and says, “So, Commissioner, are you going to give back the first round pick in this year’s draft that your office stole from me based on that phony Wells Report, or are you going to continue to push the lies that you, your league, and its paid legal and media assassins have been pushing for the last year?” Might earn him a fine, or even a suspension, and the media would go ballistic, since most of them hate him, but man, it would cement his legacy around here with the fans (if it’s not already cemented). Anyone catch the “Paid Patriotism” story today about sports teams being paid by the Department of Defense for having military personnel on the field before a game? In the segment that aired on GMA they mentioned a service woman singing the national anthem at a Bruins game as one of these acts. First off if this is true shame on the Bruins for taking tax payer money just to have a service woman sing the national anthem. They should be letting her do it for free. If they are promoting it as brought to you by the Navy, or brought to you by the Air Force then I wouldn’t have a problem with it as it is then obviously a commercial like the ones I see on TV all the time trying to help recruitment efforts. However if the Bruins took money and then played it off like they were proudly doing something for our military then some one has some explaining to do. Cue Felger calling Jacobs cheap. That’s just gross. I saw where the NFL said that any money taken would be repaid. Et tu Bob? Felger will call out the Red Sox,Celtics,Patriots if they even sneeze the wrong way but since this involves his binky,the Bruins, then you won’t hear a peep. Kudos to Dale and Holly for covering this issue today. Is this really that big of a deal? I’ll admit I only scanned the headlines, but is it so different from any other commerical transaction happening at the games? Maybe i’m just a curmudgeon but I just want to watch the games and don’t care if teams support vets, breast cancer, etc..
Is it a big deal? Not really. Is it a practice that should be called out and then eliminated or changed? Yes. It’s just flat out wrong, no matter who is running it, but seems par for the course on waste. Sadly, it sounds more like a partisan fodder story where person A, part of opposite party in power hammers person B, only because the timing is convenient. Can someone send Felger and Mazz to this class? Too bad they couldn’t do a remote from it. But, he called himself “the deflator” (eight months before the AFC title game); and he took those balls into the restroom for 90 seconds — that’s enough time to mess with them, caller, OK? It’s enough time to mess with them; why else would he take them into the bathroom with him? And he also said there was a urinal in there, when it was actually a toilet bowl. That doesn’t sound fishy to you, caller? And Brady DESTROYED HIS CELL PHONE!!!! Who destroys their cell phone? Why would he do that if he wasn’t trying to hide something? That “Over-Gronking” one made me laugh out loud. I don't think anybody needs to worry about Martha Ford's ability to run the Lions. Turn your attention to some of the other owners. Matt Millen on line one, Judy. The worst part remains the overselling of the Broncos defense – a Wade Phillips unit, meaning it will fail against smarter teams like the Patriots – and also overselling the Packers – who fail under Aaron Rodgers whenever they fall behind by more than one score.